In his first season since signing a four-year, $58 million contract extension, Minnesota Vikings defensive lineman Everson Griffen has been earning his paychecks. The veteran pass-rusher racked up his 10th sack of the season Sunday in the Vikings’ 33-16 win over the Cleveland Browns, dropping DeShone Kizer on fourth down and ending the Browns’ final meaningful possession. He was all over Kizer in London, pressuring the Browns rookie 12 times per NFL.com’s Matt Harmon, and now leads the NFL with a whopping 45 quarterback pressures in just eight games. It was Griffen’s eighth consecutive game with a sack, the longest such streak in the NFL and the best streak of his career. He went five straight games with at least one sack in 2014, his previous career high. 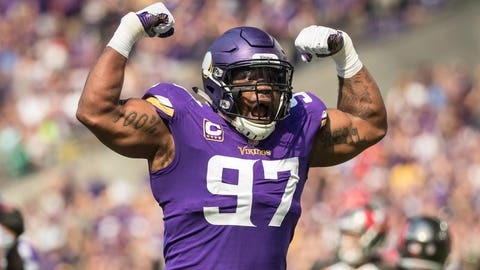 At 58 career sacks, Griffen is on pace to overtake Kevin Williams (60) for fourth on the Vikings’ all-time list before the end of the season, but moving up to No. 3 will take a bit longer. Jared Allen — who retired last year — racked up 85.5 sacks in five seasons with the Vikings, while Hall of Famer Chris Doleman had 96.5 sacks in 10 seasons in Minnesota. And then there’s John Randle. Another Hall of Famer, Randle’s 11 seasons with the Vikings featured a franchise-record 114 sacks and spawned a fierce rivalry with Green Bay Packers quarterback Brett Favre.